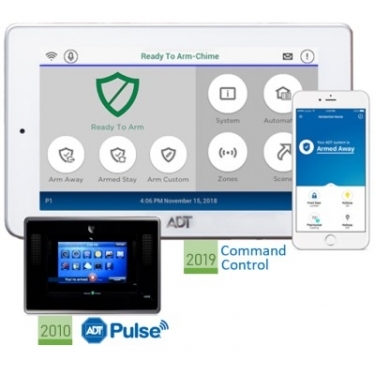 After eight years, ADT transitions from the original Pulse security and home automation system to the new Command and Control; incorporates LifeShield for DIY. Security and smart-home giant ADT (NYSE: ADT) enjoyed a respectable Q4 2018, with revenue of nearly $1.2 billion, up 7 percent year over year. But things will really heat up in 2019 when the company says goodbye to the original Pulse platform launched in 2010 and replaces it with the new ADT Command and Control —"Command" being the alarm and automation panel, and "Control" the platform and app. The company has already installed some 6,000 systems on a regional basis, but by the end of this month it will be available nationwide. Pulse had a good run, and some 3 million ADT customers are using the platform today, but "as home automation continues to evolve and become more accessible," says Don Young, ADT CIO and EVP, field operations, "customers want and expect a security solution that is fully integrated with the latest technology innovations." The self-contained wireless Command panel features a 7-inch touchscreen and built-in camera, which can snap a photo when the system is disarmed. The new platform supports over 250 devices, ranging from carbon monoxide detectors to smart light bulbs, and scene controls can be configured to trigger several subsystems at once. For example, in case of a fire, the system can shut off the HVAC fan, turn on the lights, and unlock the doors to provide a safe exit for occupants and an easy entry for responders. The panel has dual-path broadband and LTE cellular communications, and it features two-way encryption for its RF sensors to help reduce the potential for hacking. For increased control, Command offers unique user codes and permission settings that can be set by specified days and times. Other features include access to the ADT Go mobile safety app that offers family check-in and geofencing, ADT Video Doorbell integration, voice control via Amazon Alexa and Google Voice Assistant, and ADT's free interactive crime maps that provide up-to-date information on crime statistics. “We’re obviously excited about this being a successor to Pulse,” says Young. Young noted that ADT is already seeing a reduction in installation times with ADT Command versus Pulse. “The most important thing, I think, for our install workforce is, it’s a very easily upgradeable and modular design,” he added, noting that the platform allows ADT to add new features based on customer feedback very easily. Meanwhile, LifeShield, which ADT acquired in February, is still a work in progress. The DIY brand lost $10 million last year. “We continue to be excited about the DIY customer,” says ADT CEO Jim DeVries. DeVries says the talent of the LifeShield executive team was compelling. The platform currently has 20,000 subscribers. He says that e-commerce will play a key role in the future go-to-market strategy. Lastly, ADT is still refining its Amazon partnership. In September, ADT announced it would support a new feature called Alexa Guard, which essentially turns Echo and Dot smart speakers into audio sensors that register the sound of breaking glass, and smoke/CO alarms. ADT control systems would process these alerts as it would any other security sensor. The integration was expected to be done by now, but DeVries says the two companies aren't quite ready. It will happen, he says, "when Amazon and ADT are ready, and we don’t yet have a date for that." The two companies are currently piloting a program and have a team of engineers assigned to the program.